We love planning fishing bachelor parties in Fort Lauderdale, or if you're one of our silly northerly neighbors we'll even call them fishing stag parties when we're talking to you. Doesn't matter what you call it, we'll make sure that your whole group has fun fishing with us in Fort Lauderdale. Fort Lauderdale is the perfect destination for a bachelor party. There are ton of great restaurants and bars in Fort Lauderdale. In fact, we'd say we know the bars a little too well. There are also some great clubs of a certain variety (strip clubs! ), including one not too far away that was converted from a Costco or something gigantic like that. Most of Fort Lauderdale's hotels are reasonably priced and there are a bunch of hotels located within walking distance of our docks. Leave the fishing component of your Fort Lauderdale bachelor party up to us. 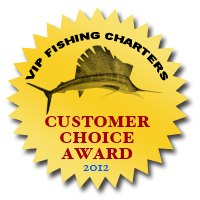 We can plan a single day or multi day fishing charter. You can go out on one of our morning trips, which is the best time to fish in Fort Lauderdale, but if you're planning on doing some partying, our afternoon trip will give everyone time to sleep in. We can accomodate up to six guys (errr people) on our Fort Lauderdale fishing boats. If you're Mr. Popular and you have more than 6 with you, we can arrange for multiple boats. This 6 person limit is not due to the size of our boat, but is a limit put in place by the United States Coast Guard. If you do split up on multiple boats, it gives us some additional fun options like putting together a mock fishing tournament where different groups compete to catch the most fish, biggest fish, or a certain type of fish. You are welcome to bring food, drinks, and alcohol aboard our boats, or we can arrange for catering. Either way, included in the price of your trip is a cooler with ice to accomodate any food or drinks you or we bring aboard. We're happy to help you plan your whole bachelor party in Fort Lauderdale, including find a place for you to stay like a hotel or vacation rental, helping you plan out nightlife options, and arrange for transportation.